The 2009 Reith Lecture series from the BBC has just finished. All four lectures are available online at both the BBC, here, and more locally, on the Big Ideas, ABC, Australia. Lecture 1 - considers the expansion and moral limits of markets. Lecture 2 - what role, if any, there is for moral argument in politics. Lecture 3 -how we should use our ever-increasing scientific knowledge. Lecture 4 - the case for a moral and civic renewal in democratic politics. The Open University is running a series of parallel discussion points on the series. There are also links to other sources, here. 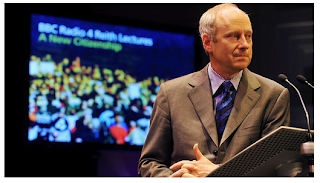 The BBC are putting together an online archive of the Reith Lecture series, here. They have a full list of all the speakers. Some have audio links so that we can re-listen - including some classics. I was a little unsure about Te Papa using their blog as the place to offer condolences on the death of Dr Bennington, and his companion, Marcella Jackson. Some might find this a little old fashioned, especially for someone who lives and breathes online, but it didn't feel the right forum. I was wrong. The blog has proven to be a brilliant way for ex colleagues from around the world to share their thoughts and experiences. Many are very moving. all of them a vindication of the Te Papa initiative, here.